Discover New Zealand's unique 15 unique geographical regions and diverse natural beauty, with its lakes, rivers, native rugged bush, the majestic volcanoes of the North Island's central plateau, the North Island skifields of Whakapapa and Turoa to the mountain peaks of the majestic Southern Alps, fiords of Milford and Doubtful Sounds, the great southern lakes, rivers, native rugged alpine bush and glaciers of the west coast of the South Island to the major South Island skifields of Mt Hutt, Queenstown and Wanaka on a national network of bus and coach services. 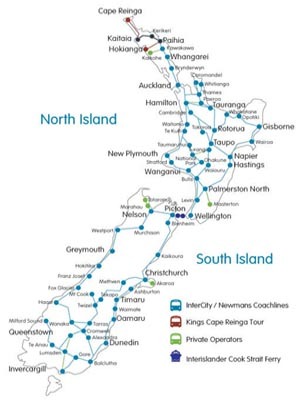 With over 150 daily services, you can travel to over 600 towns, cities, skifields and key tourist attractions through out New Zealand travelling on the national networks of Naked Bus, Great Sights, InterCity and Newmans Coachlines. With a range of affordable fares starting from NZ$1.00, travelling on Naked Bus, InterCity, Newmans and Great Sights bus and coach services, is an affordable way to see New Zealand's unique scenic beauty. Major coach and bus operators like InterCity, Newmans Coachlines and Naked Bus, operate frequent daily services to regional destinations in the North and South Islands, including services that connect with Cook Strait ferry services that operate between Wellington in the North Island and Picton in the South Island. Travel is on modern eco-friendly, air conditioned coaches and buses featuring reclining seats with foot and head rests, with some long distance coach services having on board washroom/ toilet facility. All regional and long distance bus services do stop regularly for comfort and refreshment breaks. 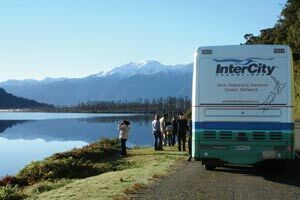 InterCity Coachlines operates the Starlighter overnight coach services between Auckland, Hamilton, Rotorua, Taupo, Palmerston North and Wellington or vice versa, connecting with Wellington/Picton ferry services between Wellington in the North Island to Picton in the South Island. The Starlighter services features reclining seats with foot and head rests, individual reading lights and air-conditioning controls, onboard toilet/washroom facility and makes two refreshment/comfort stops on route. There is a range of half and full day scenic coach tours from Auckland, Bay of Islands, Rotorua, Waitomo Caves, Christchurch, Mount Cook, Queenstown and Milford Sound. 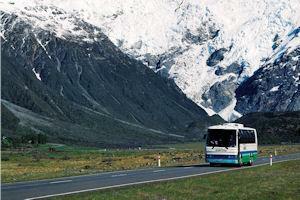 If you want to explore and see New Zealand's unique scenic beauty, there is a range of flexible 'Book As You Go' bus and ferry passes, where you can travel at your own pace on the combined bus and coach networks of InterCity Coachlines, Newmans Coachlines or Great Sights and Cook Strait ferry sailings between the North and South Islands for up to 12 months, giving real value for money travel. These flexible bus and ferry passes are available in the number travel 'Hours', travel 'Trips' travelled or you can select from a range of pre-selected travel plans. After a day's travel, there is a range of budget accommodation, backpacker hostels, motels, motor inns, apartment and hotel accommodation to choose from.